For this exercise we had to read “Territorial Photography”, an essay by Joel Snyder, and summarise the keys points he makes. After this we had to examine 2 photographers by 2 of the photographers mentioned with the text, reflecting on Snyder’s comments and through use of other references. Snyder begins his essay discussing the evolution of photography from its humble beginnings in 1839. In the beginning, photography was seen as a mechanical process, completely different from any other media used for creating pictures. Photographs were seen as “precise, accurate and faithful to the objects of scenes they represented”. Due to the perceived mechanical nature of photographs, photographers then strove to make them look technical and more like mass produced items. The first landscape photographers, of the early 1840’s and 50’s, were mostly dependant on the pictorial depictions of landscapes as used by artists as they were either educated by artists or were artists themselves. Their work was also personal and never really seen by a wide audience. This all changed in the mid-to-late 1850’s when photographic businesses arose and there quickly developed an interest for photographs of local areas that could be purchased by tourists. Publishing houses then went onto extend this so photographs of specific areas where available to audiences further afield then the local area. Photography became further distanced from fine arts because the conventions in picture making in other forms could not be transferred to photography. Photographs could only be made from what was in front of the camera. Unlike picture making, a photographer could not add something to the scene to make it more aesthetically pleasing. Snyder then went on to discuss the techniques of Carleton Watkins and Timothy H O’Sullivan. 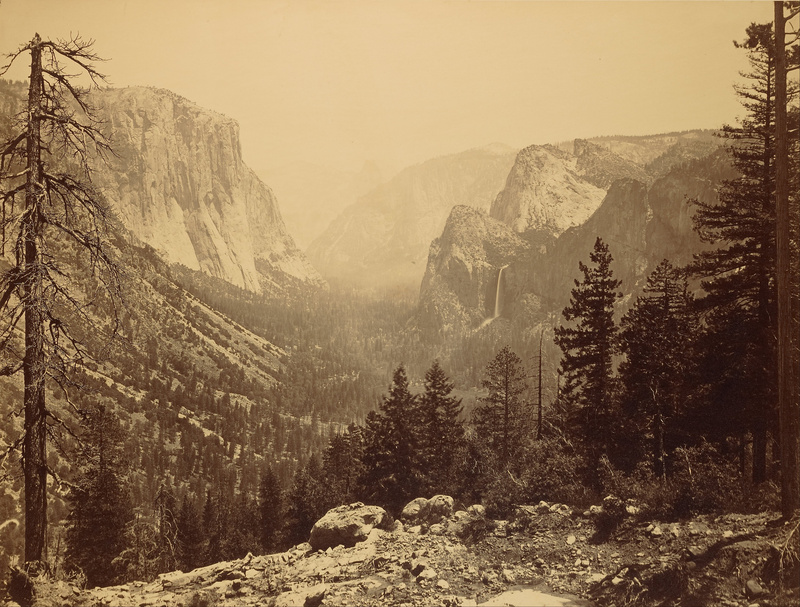 Carleton Watkins wanted to merge the idea of technical skill and the standard mode of landscape depiction. He wanted his photographs to be a “recorded sight” (something that anyone who stumbled across the scene would see). He saw his role as a photographer was to record a “reflection of physical reality” not idealised landscapes. His approach to photography collaboration between the technical and the artistic) gained him “immense power” so much so that painters such as Bierstadt, Keith and Moran began to use his work to help them construct their paintings as his photographs gave an “honest way of looking at nature”. He also began working on commission for mining, lumber and railroad industries, where he wanted to show/portray a visual harmony between the land and the industrial progress. He created this harmony by reducing the highlights and shadows to create a smooth and seamless tonal graduation. What his images didn’t show was the original inhabitants of the land and what had happened to them. His images offered reassurance to settlers that the land could withstand the onslaught of the industrial revolution. On the other hand there was Timothy H O’Sullivan who created photographs for the use in reports published by surveyors which showed the newly discovered land as bleak and inhospitable. They showed contrasts between light and shadow and he wanted to work against the normal conventions of landscape depiction by defamiliarising nature. The leaders of the explorations felt that photography was not able to produce images for the purposes of measurement and quantification so O’Sullivan’s job was to provide “generally descriptive” images of the places they visited. Once the surveys had been completed O’Sullivan’s name and photos disappeared, to be rediscovered in 1939 by Ansel Adams who described them as “technically deficient”, surrealistic and disturbing. O’Sullivan did occasionally place people within his images however they were not added to show their function within the landscape but to show the “precarious and frightful relationship between explorer and the object of exploration”. I chose this image as I found it was a really beautiful and peaceful image. It made me want to take my time exploring the different aspects of it. This coincides with Snyder’s remarks about Watkins wanting to make his images inviting to the viewer. The image gives a very good representation of the scene and the viewer can recognise this as a true to life image. The angle that Watkins has chosen to take the shot has helped to “emphasise its accessibility” and yet show the “breath-taking grandeur”. Although Watkins image is a true image of the scene, there are a number of factors within it that follow the conventions of landscape depiction such as the leading lines drawing the viewer to the centre of the image and the image being structured in line with the rule of thirds. Watkins’ image is spectacular, however it does not address the previous inhabitants and where they are now as Snyder raises in his essay. The scene gives the impression that it is awaiting new inhabitants and the grandeur gives the impression that, as Snyder puts it, able to withstand the onslaught of mass immigration and industrialisation. There is so much from Synder’s essay that rings true with this image. Firstly, O’Sullivan’s image is a stark contrast to Watkins’ image. The landscape comes across of very alien and sparse. I get the impression, from the image, that O’Sullivan had gone out of his way to take the image. Thus making the scene seem unfamiliar to the viewer. It is a perfect example of how O’Sullivan wanted to show a “denatured” nature. The scene he has chosen to photograph does not appear to have any plant life, so shows how it is unable to support life and is inhospitable. 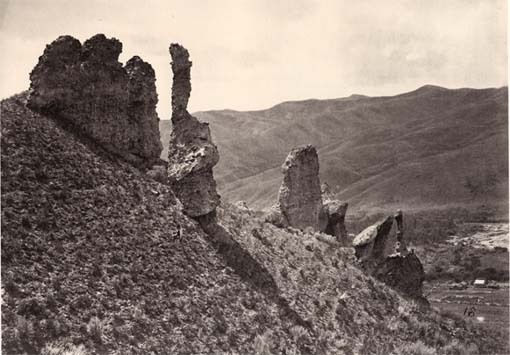 Like Watkins, there are some conventions of landscape depiction that can be seen within this image such as leading lines, some slight use of the rule of thirds and depth of field i.e. showing the foreground in detail and the background slightly defocused. This entry was posted in Landscapes, Photography and tagged Carleton Watkins, Joel Snyder, landscape depiction, landscape photography, OCA Landscape, OCA Landscape Part 2, Territorial Photography, Timothy H O'Sullivan. Bookmark the permalink.